This useful Should I Accept A Job Offer Calculator is developed to help you to decide if you should accept a job offer by examining the difference in base salary, tax, after tax salary, superannuation, and net income across the current job and the new job. I built this calculator when I need to decide if I should accept a new job offer in late 2011. The base salary of the new job is $15K higher than that of my current one. In order to decide if I should accept the offer, I need to work out how much money I can bank into my pocket after tax. This calculator tells me that I can get $10,425 more ($9,075 more on after tax salary and $1,350 more on superannuation). It seems not bad because I could possibly have extra $756.25 to spend on a monthly basis. However, the new job takes more travel time - about 1 hour per day. The calculator shows that the new job's hourly rate is actually $0.25 less than the current job when taking this extra 1 hour commute time into consideration and the hourly superannuation of the new job is $0.07 more than that of the current job. It means that I actually make less money if I take the new job because I need to spend more time on the road. By using this Should I Accept A Job Offer Calculator, I decide to turn down the offer as I believe I could better spend the extra 1 hour commute time with my families. I believe many Australians will face the same situation everyday, so I decide to make this calculator free to download. I hope it can help you to make the "should I accept a job" decision. 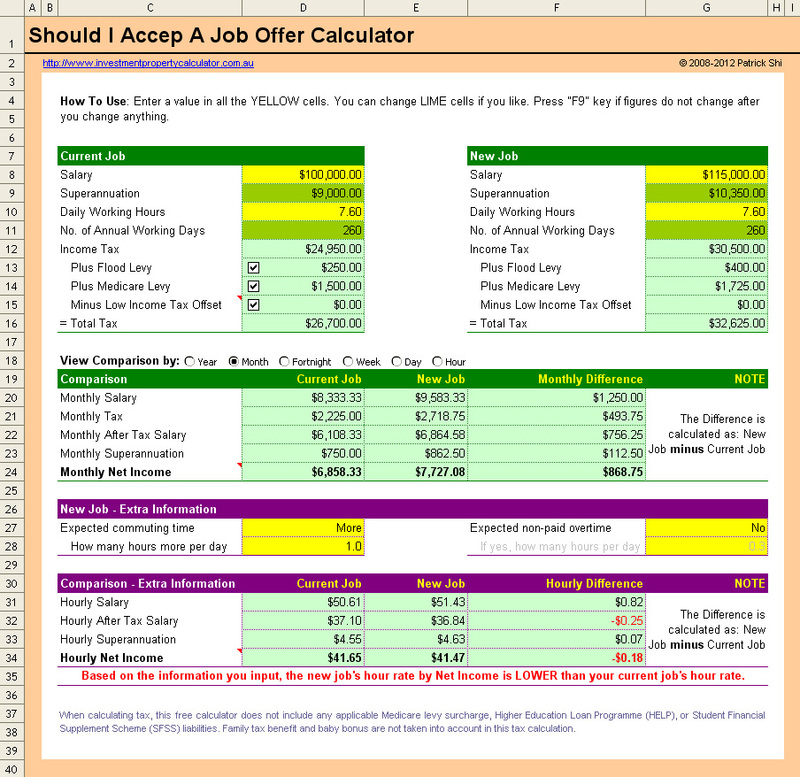 Here is a screen shot that will give you a better idea that what you need to do and how this free Should I Accept A Job Offer Calculator may help you. Here is a list of features that this Should I Accept A Job Offer Calculator has. 9. Allows to set Australia tax rates. 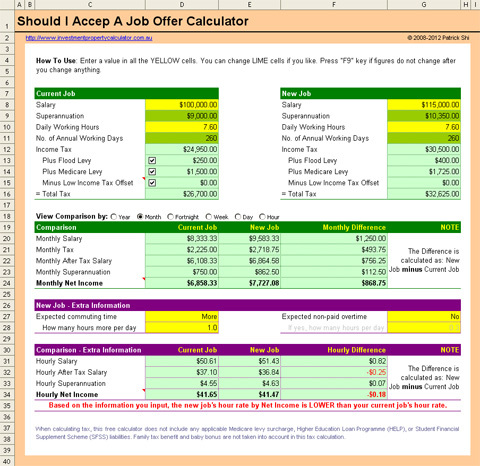 Download FREE Should I Accept A Job Offer Calculator Now!